Truth: Hats do not cause hair loss. Individuals with hair loss may wear hats to cover-up their areas of hair loss, but hats do not cause hair loss. Truth: Hair loss does not occur from clogged pores. Truth: Hair loss does not result from decreased blood flow. You can increase blood flow to the scalp as much as possible and hair growth will not occur. Truth: Massaging the scalp may feel good, but does not stimulate hair growth. Truth: Washing the scalp does not cause hair loss. Individuals with hair loss commonly reduce the frequency of washing out of fear it is causing hair loss. However, washing does not cause hair loss. 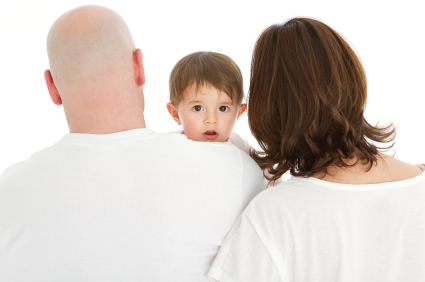 Myth 6: Genetic hair loss comes from mom’s side. Myth 7: Wigs cause hair loss because the scalp can’t get oxygen. Truth: The scalp gets its oxygen from blood vessels deep under the scalp not from the air. It’s true that wigs can cause hair loss if clips , pins or adhesives used to attach the wig to the scalp pull on existing hair. Otherwise, wigs don’t cause hair loss. Truth: 10 % of women in their 20s are affected by genetic hair loss and 20-25 % of women are affected by age 40. Genetic loss affects young women. Truth: Hair dyes can sometimes damage the hair fiber but it is not a common cause of hair loss. Truth: Dandruff does not usually cause hair loss.